The leader in business continuity and bandwidth management offers a free book to learn more about Internet connectivity for organizations. Elfiq Networks, in partnership with Wiley, the publishers of the renowned “For Dummies” series of books, released “Business Internet Access Optimization For Dummies”. This book is designed to help decision makers and information technology professionals maximize their connectivity and uptime for their most critical communications service, the Internet. 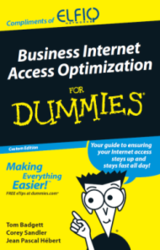 “Business Internet Access Optimization For Dummies” is available free of charge to qualifying organizations from Elfiq Networks at http://www.elfiq.com/dummies. Using non-technical terms, this book outlines Internet connectivity best practices, advice, strategies and cost-reduction options for any organization, from the small business to the global enterprise. Elfiq Networks’ link balancers enable organizations to utilize multiple concurrent ISP circuits to prevent Internet connectivity downtime and improve overall access performance. With more Internet-based applications and services being used in organizations every day, proper access to the Internet has become a critical asset for normal business operations, where loss of connectivity or ISP link saturation can result in lost revenue or internal productivity losses. Elfiq Networks (Elfiq Inc.) is a leader in the development of innovative telecommunications and security solutions used in over 130 countries. Aware of today’s economic stakes, Elfiq provides leading-edge business continuity and bandwidth management products to businesses in every sector, making IP communications reliable, resilient and operating at optimal performance. Elfiq is a privately owned company headquartered in Montreal, Canada. For more information, visit http://www.elfiq.com.